Constantius II, Roman Emperor (7 August 317 - 3 November 361, reigned 337 - 361), was the middle of the three sons of Constantine I the Great and Fausta. He was born in Sirmium (city in Illyricum) and named Caesar or Junior Emperor. 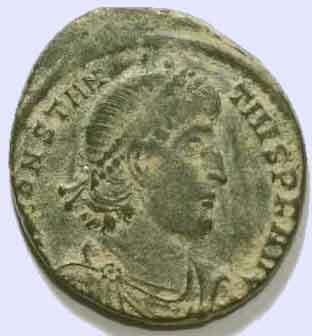 When his father died in 337, he led the massacre of his relatives decended from the second marriage of Constantius I Chlorus and Theodora, leaving himself, his older brother Constantine II, his younger brother Constans and two cousins (Julian "the Apostate" and his brother Gallus) as the only surviving adult males related to Constantine the Great. The three brothers divided the Roman Empire between them according to their father's will. Constantine II received Britain, Gaul and Spain; Constans ruled Italy, Africa, and the Illyrian provinces; and Constantius ruled Constantinople and the East. This division changed when Constantine II died in 340, trying to overthrow Constans in Italy, and Constans become sole ruler in the Western half of the empire. The division changed once more in 350 when Constans was killed in battle by forces loyal to the usurper Magnentius. Until this time Constantius was preoccupied with fighting the Persian Empire, and he was forced to elevate his cousin Gallus to Caesar to assist him while he turned his attention to this usurper. Constantius eventually met and crushed Magnentius in battle at Mursa Major, one of the bloodiest battles in Roman history, in 351. Magnentius committed suicide in 353, and Constantius soon after put his cousin Gallus to death. However, he still could not handle the military affairs of both the Eastern and German frontiers by himself, so in 355 he elevated his last remaining relative, Julian, to Caesar. As Julian was hailed Augustus by the army in Gaul, Constantius saw no alternative but to face the usurper with violent force. As the two armies sought engagement, Constantius died from a fever near Tarsus on November 3, 361, and Julian was hailed Augustus in the whole of the Roman empire. Constantius took an active part in the affairs of the Christian church, frequently taking the side of the Arians, and he called the Council of Rimini in 359. See also: Byzantine Emperors, Roman Empire and Byzantine Empire.